There's an unwritten rule among documentary filmmakers to observe, but not participate. 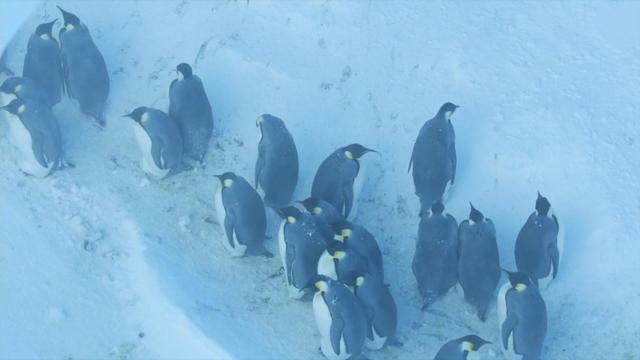 But a BBC documentary crew in Antarctica made a rare decision to intervene when several Emperor penguin mothers and their chicks became trapped in a ravine and cut off from the colony. On Sunday's episode of the "Dynasties" series, mother penguins can be seen leaving chicks behind when they can't make it up a slope. Some chicks died from the extreme cold as temperatures dipped to as low as minus 76 degrees Fahrenheit. After a storm, the crew returned to the area and decided to build a stepped ramp that helped the remaining penguins climb to safety. 'We opted to intervene passively," said the show's director, Will Lawson. "Once we'd dug that little ramp, which took very little time, we left it to the birds. We were elated when they decided to use it." The show's creator, world renowned naturalist Sir David Attenborough, is known for his strong preference to let nature take its course. But in this case, he says he would have intervened. "It's very rare for the film crew to intervene," he said in the narration of a video clip published by Country Living. "But they realize that they might be able to save at least some of these birds, simply by digging a few steps in the ice." In 2013, Attenborough defended the decision to film the death of a baby elephant in the BBC's "Africa" series, saying it was "very important" to simply observe. "That particular creature was dying of starvation, [and it was] far too dangerous to intervene," Mike Gunton, "Dynasties" executive producer, told the BBC. "If you tried to go there, the mother would probably have attacked you. "If you fed it, it would survive for maybe another hour," Gunton added. "But because there was no food anywhere, ultimately – and this is David's point – ultimately, you are just prolonging the misery and you let nature take its course." But in the case of the penguins, Gunton says he agreed it was justified to intervene. "It's such an unusual circumstance to do this," he told BBC Radio 5 Live. "There were no animals going to suffer by intervening. It wasn't dangerous. You weren't touching the animals and it was just felt by doing this... they had the opportunity to not have to keep slipping down the slope." So far, the public's response to the crew's intervention has been mostly positive.